Writing a Business Plan: How ‘Fuzzy’ Can My Goals Be? You are here: Home / Business Strategy / Writing a Business Plan: How ‘Fuzzy’ Can My Goals Be? 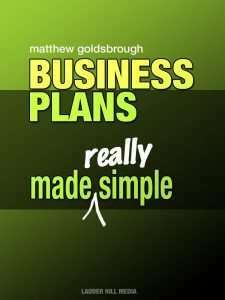 This week, my first ebook, Business Plans Made Really Simple, was published. If you’ve wanted to write a business plan and not known how to go about it, I’m sure you’ll find it helpful. One of the topics covered is the setting of objectives. People tend to think that objectives have to be measurable – sales targets, growth, profit margin – and I absolutely agree. But some of your objectives will be ‘fuzzy’, and that’s OK.
A while ago, I found a scruffy old Greek school exercise book while clearing out a cupboard. I must have used it while on holiday many years ago. One page was headed ‘Freedom Plan’. I don’t remember writing it, but it’s my objectives for my working life. Amongst some concrete goals, it lists objectives for a business such as ‘I can take my dogs and cats to work’, ‘Isn’t something that goes out of style’, and ‘Can be supplemented by Internet’. At the time, I might have been abashed at writing those in a formal business plan, but I wouldn’t be now. They were clearly important to me – and every single one of them has come to pass. I achieved all of my fuzzy objectives. So when you’re writing your business plan (aided by my ebook! ), do allow yourself to add to your measurable goals those fuzzy objectives that are important to you. Only you know what those might be. Then you’ll have the complete picture of what kind of business you’re trying to create. And a more useful business plan. Matthew is your ultimate business mentor, who shares his vital knowledge and inspiration in the uttermost professional, charming and supportive way.